Quote Reply Topic: Minoan civilization originated in Anatolia! Some very interesting news on the Minoan civilization. There was a dispute as to where did the population of Minoan Crete originate from. Some indicated Egypt and others Anatolia. Now, a research called: "Origins of Neolithic populations in Greece, based on Paternal DNA" has been published by the professor of Genetics at the Aristotle University of Thessaloniki, Mr. Triantafillidis, in cooperation with Uni's in US, Canada, Russia and Turkey. He has identified DNS in 193 individuals from Cretan males and 171 from mainland Greece. results were compared to other samples in other universities. Results showed that Minoan Cretan samples compared with the Anatolian ones, while the Greek mainland compared with Balkan ones. Of course, as proven by other experiments, the professor said, we have proof that also mainland Greek genes originate from Anatolia too, but entered Greece through different routes. I don't think comparing DNAs with so ancient civilisations is viable. The Minoans were destroyed by the Myceneans which were not too kind to their enemies if Iliad is to be believed. Plus after that came the Dorians and later Kilikian pirates and later Romans and Saracens and then the Byzantines brought other populations from the mainland and then came the Venetians and the Turks. That doesn't mean anything, and there's nothing that indicates they originated in Anatolia. If anything this just means they mixed a lot with Turks. 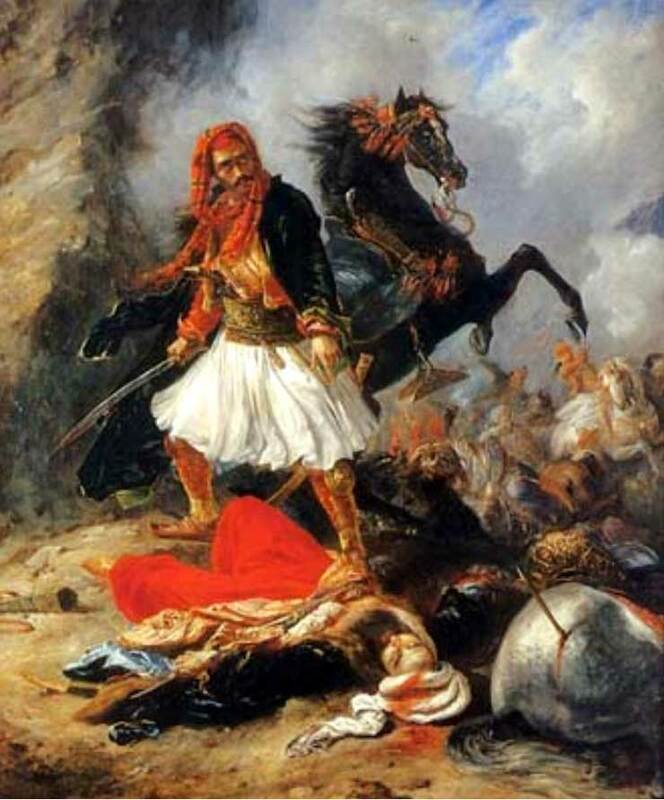 Greeks aren't native to Anatolia, they were colonizers. Crete population was quite close wasn't it? If you have some sequences characteristic to Minoans then they will be preserved despite following crosses. And frequency of those sequences should increase in close society due to inbreeding. What I meant is that the Minoans were possibly wiped out by the Myceneans. At those ages it was common to kill most of the enemy's population and Crete's archaic history is full of wars. If my memory serves me right, from the Dorian invasion to the Roman times the island was at war between its major cities. This is nothing new...Basically, this theory was already expressed back in the 50s. Now at least we seem to have genetic evidence. I'm not surprised at all. Have a look at Greek placenames for example. There's a huge amount having Anatolian possesive forms on words of unknown etymology. However, a respectfull amount of placenames are known Hittite/Luwian/etc words in possesive form. Just an example: Parnassos --> Parna (Luwian for "House", masculin) + -ssos (anatolian plural possesive form for masculin words), Melissa(gk. Bee) --> Melit (Luwian for honey) + -ssa (plural possestive form for feminine words). The city of the Amathusans honored the king/noble Ariston son of Aristonax. we have proof that also mainland Greek genes originate from Anatolia too, but entered Greece through different routes. Yiannis where can the report of Α.Π.Θ be found? Hittites and Luvian speakers were native Anatolians, not Greeks however. I don't see how one can jump to such a conclusion from such an unscientific bit of news. I didn't say the were Greeks. But Greeks weren't alpine people eather. Do you think Greeks entered Greece though northern Europe or Anatolia? Just look at the language groupings of Greek, Phrygian and Armenian. They can't have all come from different regions. And I did not jump to such a conclusion just like that. There is plenty of material on that matter for over 50 years now. Hesperia, Vol. 31, No. 3. (Jul. - Sep., 1962), pp. 284-309. Moreover you have archeological evidence that the cultures that inhabited Greece in late neolithic and the bronse age came from east. Safron appeared with the arrival of the early Greeks and as we know Saffron does not grow on many places of this earth. The agricultural evidence is generally clear. Btw, the Hittites and Luwians were not native eather. It depends on which period you look at. They were for sure the descendands of the earliest IE people entering the area. I was always fascinated by the prehistoric era of Greece. Those times are very interesting. I get most of my material from the "Scholarly Journal Archive" (www.jstor.org) but you need an account there and that is not free. Also, there's a lot of PDFs spreaded around at various universities on the matter. However, I can't really remember since all material i have is a collection from the last 2-3 years. I found a press release about it in Greek. The translation is probably crappy but just for the record i will post it. "The origins of the Neolithic people of Greece" is the title of the research conducted by professor Konstantinos Triantafilidis of the Aristotelean University of Thessaloniki in cooperation with the university of Crete and universities in the USA, Canada, Russia and Turkey. In the research 193 blood samples were collected from men living in Crete and 171 from men living in the Greek mainland, near to known neolithic settlements. Specifically from New Nicomedia (Veria, Makedonia), Sesklo and Dimini (Thessaly), Phracti and Lerni (Kranidi, Argolis). The results of the research were compared to researches made in Europe, Anatolia and Africa. The absence of the genetic markers J2b-M12 in the inhabitants of the neighbouring areas of Bosporus, shows that those neolithic people came to Greece through sea. The Y-Chomosome results of the Cretan population showed that it is grouped together with the people of Anatolia. 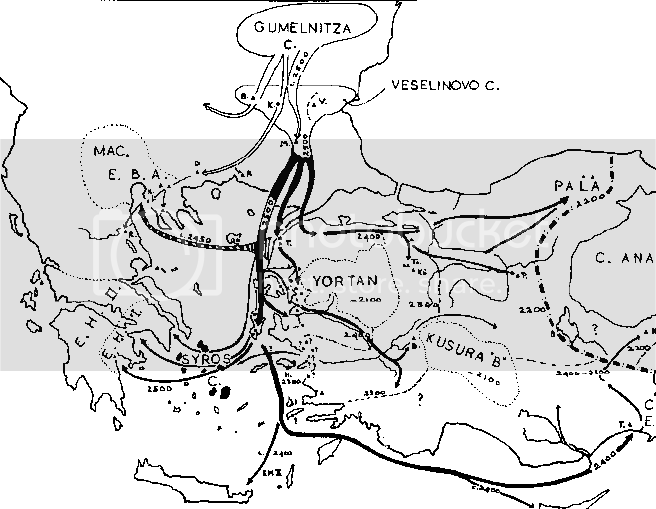 The samples of the Greek mainland are paritaly grouped with the palaiobalkanic cultures. This cocludes that the neolithic people of Crete came from Anatolia. Ofcourse the other genetic markers of the Greek mainland show that a part of those neolithic people came from Anatolia as well. It is worth to mention that the case of the samples from the Phracti cave in Peloponesus, show relation to the populations of Crete. This fact probably prooves the geographic ifluence between Crete, Peloponesus and Anatolia. Also, it should be mentioned that the later settlements in crete around 1100BC are from people of the mainland and is represented by the V13 genetic marker. This marker appered in a frequency of 35% in Thessaly and Peloponesus while in Crete it reached 7% and therefore shows the genetic effect the those people produced. The wider genetic effect of the mainland in Crete reached 20%. The dating of the halogroup J2a1h-M319 in Crete is placed at 3100BC. The importance of these results in archeology is very valuable for the historians, since it marks the limits between the Neolithic and the broze age in Crete, which is related to a sequence of important changes in the organization of the social services, the demographics, the material culture, the technology, the iconography and the burial rites. Many researchers suggested that the arrival of the new settlers was responsible for those changes; a social/cultural ressurection from which the famous Minoan civilization rised. Those new impressive characteristics that are connected with the early bronze age in crete have been previously proposed to originate from Egypt, Libya, Syra, Palestine, eastern Aegean an Anatolia. Contrary to the theory that the minoan civilization was a result of settlers from Egypt and Libya, the majority of the halogroups e3b1-m78 is characterized from the monocleuid marker V13, in Crete and equally in the mainland of Greece. In the samples however from Egypt this marker was not found. This shows that there was no recent genetic contact between Egypt and Crete/Greek Mainland. In other words, the Helladic area was not invaded by Egyptian populations as the DNA analysis show, but by settlers from Anatolia. Those results disprove the Aphrocentric theory or Black Athina, which was presented by some scientists of questionable nature. According to that theory the Greek civilization was a result of africans. It is worth to mention that the study of the mitochondrial DNA and the Y-Chomosome, showed that the 80% of the inhabitatnts of Europe have palaiolithic origins. It is also known that the oldest neolithic settlements in europe are found in Greece. The scientific research of the origins of those people is done based on the findings provided by different scientific fields e.g archeology, linguistics, genetics; while many discussions are held about how, when and from where those people can from in the neolithic period in south eastern europe. In order to answer those questions, the DNA of the chromosome Y was studied. The markers of the Y-Chromosome are inherited and unaltered from father to son, from generation to generation and therefore create paternal genetic trees. This gives us the chance to understand the origins of human populations. you needs to read a little closer and not jump on the defensive so easily. Like you said Turkey and Greece share much of the same genes (although the Greeks are probably much more genetically consistent), but I think this is all it proves. I just don't think the test can be applied to the question at hand due to the few thousand year time difference. True, but they were there long before the Turkic invasion. The Greeks Hellenized and mixed with the natives in the same way the Turks have today so I would agree that the Minoan population has been absorbed over the centuries. I saw all the different faces while I was in Turkey as a testimony of intermixing. This still would make an interesting study, what were their origins-?? Yes sure, actually I believe the people of Anatolia are our common link. I don't believe the Hittites vanished for example nor the Phrygians (who were identifiable at least until the 6th century AD). They just passed and embodied to different nations from time to time. However, on your last sentence, please have a look on what the press release says about the examination of the Y-Chomosome. This was used cause it passes unaltered from father to son which means the timeframe can not easily distort the results. Now, It would be interresting to know which university in Turkey participated and see the report it has released, if any available in public yet. "As for the everything was greek sites i guess you've hit something like this: http://e-e-e.gr "
I am sure that by now you've heard of a thing called "Google" or another one called "Yahoo", they can help you overcome your ignorance and calm your hatred. Sorry for the oftop. Flipper, here is nice example of negative attitudes of Greeks toward Maks. I guess Epikoureios just didn't realize you are Greek. Your "ignorance" arised from the country he suggested you are from. Welcome to the forum, Epikoureios!